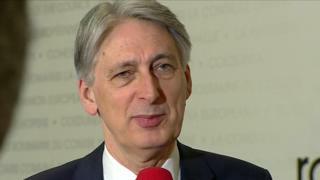 Chancellor Philip Hammond has said he is “optimistic” Brexit discussions between the government and Labour can reach “some form of agreement”. Mr Hammond said there were “no red lines” in the meetings. But Labour’s Diane Abbott says the government has made “no movement” on the political declaration, which outlines future UK-EU relations. Downing Street responded by saying it was prepared to pursue alterations to its Brexit deal and was ready to hold further discussions with Labour over the weekend. Reality Check: What’s in the Brexit political declaration? Mr Hammond said: “We should complete the process in Parliament… Some people in the Labour Party are making other suggestions to us. Of course, we have to be prepared to discuss them. The prime minister has been unable to get Parliamentary backing for the withdrawal agreement she secured with the EU in November last year, which sets out the terms of the UK’s departure. Labour has said it wants fundamental changes to a document drawn up at the same time, known as the political declaration. It sets out ambitions for the future relationship between the UK and EU after Brexit – including on trade, regulations, security and fishing rights – but does not legally commit either party. Shadow home secretary Ms Abbott told BBC Radio 4’s Today programme that Labour had engaged in the talks “in good faith” and shadow Brexit minister Sir Keir Starmer had written to the government to say he wants them to continue. She said there was concern that the government did not want to alter the political declaration and “that is key”. On Friday, Sir Keir said ministers were not “countenancing any change” to the “actual wording”. “We do need change if we’re going to compromise,” he said. A Downing Street spokesman said after Friday’s talks that “serious proposals” were made and it was “prepared to pursue changes to the political declaration in order to deliver a deal that is acceptable to both sides”. BBC political editor Laura Kuenssberg says there was a sense that the government has “only offered clarifications on what might be possible from the existing documents, rather than adjusting any of their actual proposals”. She says the UK would prepare to field candidates in May’s European Parliament elections if MPs failed to back a deal. But education minister Nadhim Zahawi told the Today programme it would be “a suicide note of the Conservative Party if we had to fight the European elections”. He added the elections would pose an “existential threat” to both the Conservatives and Labour if they “haven’t been able to deliver Brexit”. Any extension to the UK’s departure would have to be unanimously approved by EU leaders. Irish Prime Minister Leo Varadkar said a longer delay to Brexit “might make more sense” than the UK seeking “an extension every couple of weeks or every couple of months, because that just adds to the uncertainty for citizens, for businesses and for farmers”. However, French Europe minister Amelie de Montchalin said such a delay would require the UK to put forward a proposal with “clear and credible political backing”. “In the absence of such a plan, we would have to acknowledge that the UK chose to leave the EU in a disorderly manner,” she added. A senior EU source told BBC Europe editor Katya Adler that Donald Tusk would propose a 12-month “flexible” extension, with the option of the UK leaving sooner once Parliament had ratified a deal.